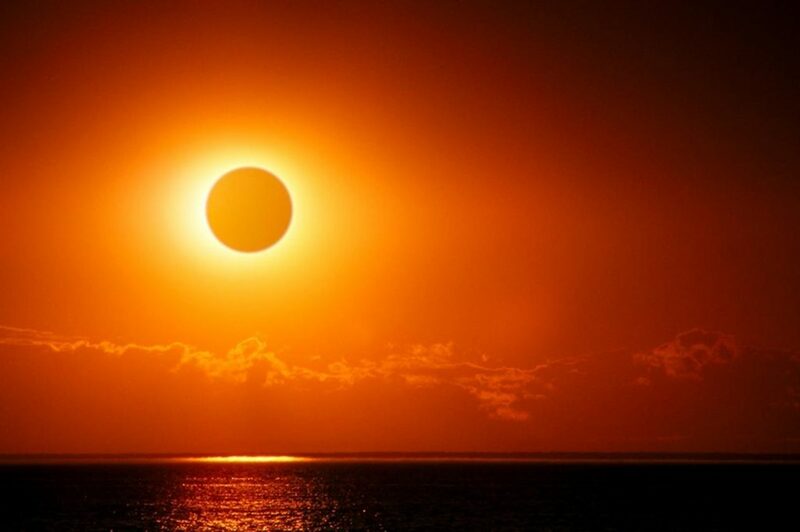 The effect of eclipses is felt for a period of six months. However, the nodes (Rahu and Ketu) are changing signs, which indicate that one or another major change will occur in life during the next 18 months. We look to this eclipse from Uluru, the heart chakra of the Earth and on major leylines. Eclipses affect all places on Earth, visible or not due flocculation of the blood within humans (solar manifestation of light is hidden from blood). This eclipse occurs in Magha nakshatra: Magha becomes weakened or ineffective for the next six months. Magha is of ugra nature – fierce and severe with abrupt incursions; Magha is ruled by Ketu and is creative in nature. Whereas Magha is normally favourable for ceremonies and events in the public domain, attention must be paid to the nature of the year – Hevilambi – which presents deleterious results due poor timing of events; proper attention has to be made towards selecting muhurtam and Magha nakshatra should be avoided. Eclipses affect nations. This effect will be mostly felt in North America, however, regions seeing a partial eclipse are: West in Europe, North/East Asia, North/West Africa, Canada, Much of South America, Pacific, Atlantic, Arctic. US President Donald Trump was born during an eclipse. There will be challenges to President Trump over an extended period of time. The challenges will not result in impeachment as he has protection of Planet Jupiter. The U.S. will experience significant cultural challenges from heretofore quiescent groups in society which will give illustration to an significant need of the US to re-evaluate its attitudes to different cultural groups and their salience as participants in society and culture. Rahu causes the eclipse and moves to Cancer, taking the smokescreen with him. Effect: The U.S. may have to revisit the consequences of punitive and military actions taken against terrorists and other self-selecting combatants at home and abroad. This may include treatment of detainees at Guantanamo and similar black sites operated by the US. The karma may be of a recurring nature and of severe embarrassment to the US. There is some indication that there may be financial disruption or recession emerging from the U.S. – this will be a seeming, an appearance and not result in a world-wide recession. Attitudes toward maligned groups and groups with severe ideological differences will emerge into the public domain and capture much attention. There is opportunity to practice settling of differences without resorting to violence. A number of crop circles have featured Sun, Moon and planets indicating change of energies after this eclipse. Futher notes will be provided.